Agreed, @Elementary Penguin, at that price you'd think they could have at least included either the original YS album or the Songtrack, and a copy of the film. I mean, the thing's official, available through The Beatles Store, so it's not as if they couldn't have. Why can I count six pairs in the box? He's probably using a different counting system. Aaahhhh... I'd hoped that was more info, but just the Paul quote from DIY Magazine I drew attention to in this thread on 20 June, and which mmm posted in full. Well, apparently the release date is the 22nd. Is that also old news? I don’t visit here often enough to know. Well, 50th anniversary of the original release date is an easy re-release date to "expect". I expect the same. There's still no confirmed information, just Paul's quote. I think confirmation won't come until about a month before, which will be late October. Confirmation with Pepper came a month before, and this year the same timing allows the Imagine box set to be in the past. I was just hoping some more detail had slipped out. The US John Lennon Music Icons stamps to be issued on Friday 7 September will be marked by a dedication ceremony at the Naumburg Bandshell in Central Park, New York City, at 11am on the day of release. "The US John Lennon Music Icons stamps to be issued on Friday 7 September will be marked by a dedication ceremony at the Naumburg Bandshell in Central Park, New York City, at 11am on the day of release." And the MC, Dennis Elsas, has kindly agreed to wear my John Lennon neck tie! 🙂 So, in some 'fashion,' I will be there. 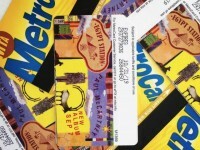 Should any one be interested, and either be in NYC or know somebody in the vicinity, the MTA have a limited edition (50,000) Paul McCartney Egypt Station MetroCard. NYCT Subway say "it is available at the 42nd St-Grand Central station in the larger MetroCard Vending Machines and station booths while supplies last". Could Paul decide to put in an appearance? Thought we'd had all the news surrounding this Imagine re-release, but Variety reports there's more. There will be a new feature-length documentary about the making of the album, John & Yoko: Above Us Only Sky, broadcast later this year. Commissioned by UK broadcaster Channel 4, it seems producers Eagle Rock have full access to archive. The message of Imagine is just as powerful today as it was when John and Yoko wrote it nearly fifty years ago. I look at the world see it overcome with hate and engaged in wars seemingly without end, and I truly miss John's voice. We need him now more than ever. And that is what we hope to do with Above Us Only Sky, show how John and Yoko's message of peace and love still matters. With exclusive access to the extensive Lennon video, audio and photo archive, including much previously unseen material as well as interviews with a wide range of people directly involved with the recording, this is an exciting opportunity to tell this story fully for the first time. I would imagine the first broadcast will be in the UK, with maybe PBS picking it up for the US (they were the first to broadcast LennoNYC), with a DVD/Blu-Ray release to follow at some stage. I'll take more Lennon stuff, thank you. You can watch the stamp dedication here. It looks like Paul didn't make it. It was a touching tribute, but I wonder how Yoko is doing mentally. I didn't quite understand what she was trying to say about the crowd size and Hitler. And it seemed like Sean was trying to get her to stop talking. Sir Paul is diving deeper into the x-rated world. The cover of today's New York Post reads "Beat the Meatles" with the sub-headline "Come Together " and a large picture of the Paul and John in their early years. This is based on some admissions in GQ magazine. The borrowed Maton guitar George played in July and August 1963 (a period which included their final performance at the Cavern on 3 August) while his Gretsch was being repaired has sold at auction for £347,200 (approx. US$452,663.74). Yoko Ono, Ringo Starr & Jeff Bridges get in bed with The Lennon Bus presented by OWC to support student activism in association with Join Sleep Club. All donations are split evenly between The Lennon Bus & No Kid Hungry. Many congratulations to Paul McCartney on Egypt Station debuting at no. 1 in the US albums chart! It's his first debut at No. 1, and first chart-topper since 'Tug Of War ' in 1982. Our boy does it again!